he is very valuable contributer to a lot of great articles in our forum. He post his ideas and thoughts on gold making and also a variety of other topics on our forum mostly during the wow server downtime on Tuesday. Today Daknit is taking his guides writing to the next level with this special list and also June, July and August forecast and he is sharing this useful information for free to you! Make no doubt, as WoW’s daily grind begin to dull, the AH is the PvP to be. The Auction House is the only true core of economy in WoW, and its terrain can be lucid and very volatile. The purpose of the Azeroth’s Farmer’s Almanac is to inform WoW’s players how to master the AH’s ups and downs, as well as when and what to expect. The information provided is a general forecast for all servers and not just for one specific server. The accuracy of a forecast is based upon the average nature of players’ gaming habits, population of a server, times of population fluxes, weather, and activity of real life events. A typical gamer can play for a couple of hours between 3pm (students) or 5pm (working stiffs) up to midnight or 2am, depending of the day of the week. 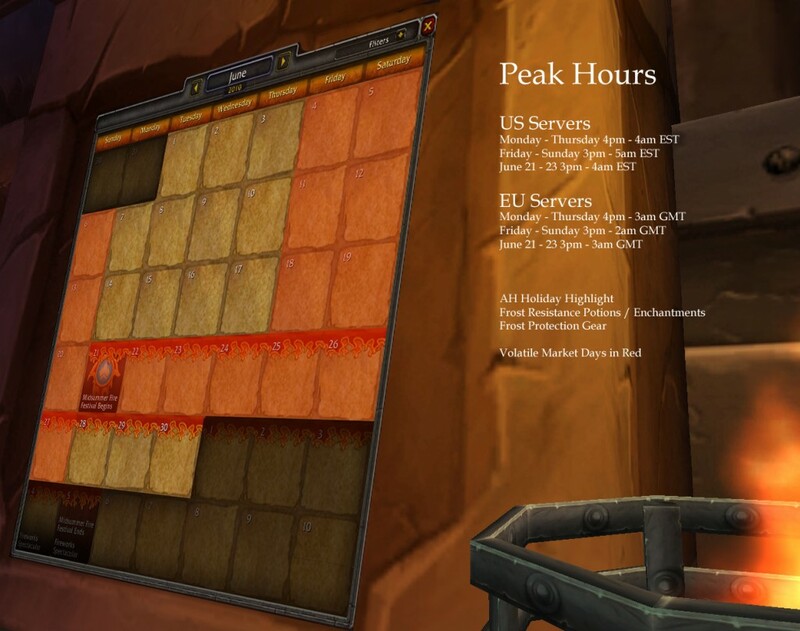 Taking into account that US east coast players and US west coast player can both play at the same time and on the same server, Peak Hours can vary by 2 or 3 hours. Naturally, AH stableness and predictability vary from server to server. AH prices can be very unstable on low population servers. More people working the sales and buying leads to favorable fixed prices. The AH on PvP servers are more reliant on consumable buffs such as elixirs, while PvE servers focus more on gear and crafts needed for speed leveling. Above average population surges, as during the beginning of world events, can lead to no holds bared selling and buying and extreme AH instability for a duration of 48 hours. Gamers that live within a time of cold or wet weather can expect to login more hours of WoW. Peak Hours can be rated in terms of high, low, and extreme. November thru January offer many extreme peak hours across all servers in the northern hemisphere. Lower peak hours occur in the US in May thru August as this is prime vacation time with most families. Real life events also can result in low and high peak hours. School sessions, major sporting events, spring and winter breaks, and popular video game release dates are all very visible factors. Various peaks can be expected during term finals, national holidays, and, yes, even during prom/homecoming seasons. 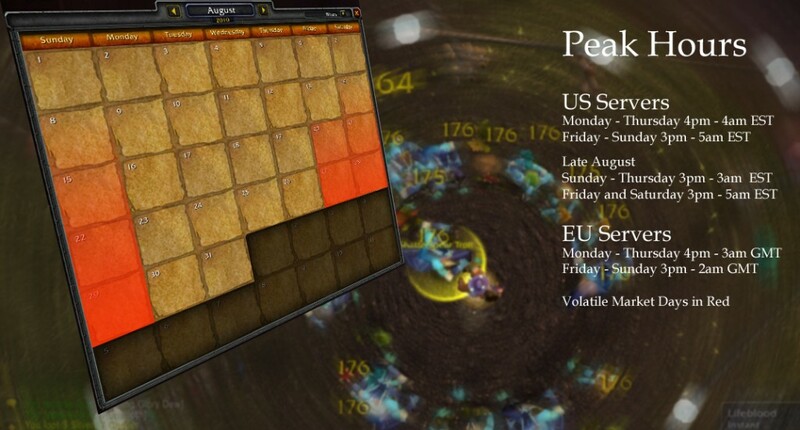 The compiled dates and features below are the best forecast for WoW economics to come. Taking into other factors as well as the one listed above, the Azeroth’s Farmer’s Almanac is very accurate, if not very generalized. Core items are the most coveted and needed pieces of investments that can be found on the AH. Using Dugi’s Profession Guides, these are the core items of worth needed for a speed skill 1 – 450 in any profession. These items will be monitored and price fixed by the knowledgeable and the more efficient players on your server. If you buy and sell solely from this list, you will become one of those players. The list below is organized by need. Items listed as “Very High” are items that are of the highest demand. Items listed at “Very Low” are still needed, but will sell at a lesser rate. Higher items exist in a more stable market than those of a lesser demand. Resale of Med, High, and Very High core items listed at under 75% of the market average will always net you profit. Items of Low and Very Low status are best sold during high population peaks when a higher number of players are perusing the AH. Note: High end items (such as jewels for crafting and titanium ore), are based on wants and not needs. They are luxury items. While profit can be made from items of “want,” they are not items of “need.” There are more players that “need” core items over players that “want” luxury items, so sales are more profitable when dealing with a majority. In the month of June, peaks are at a low as the once regulated school children now have free schedules to play when they choose. 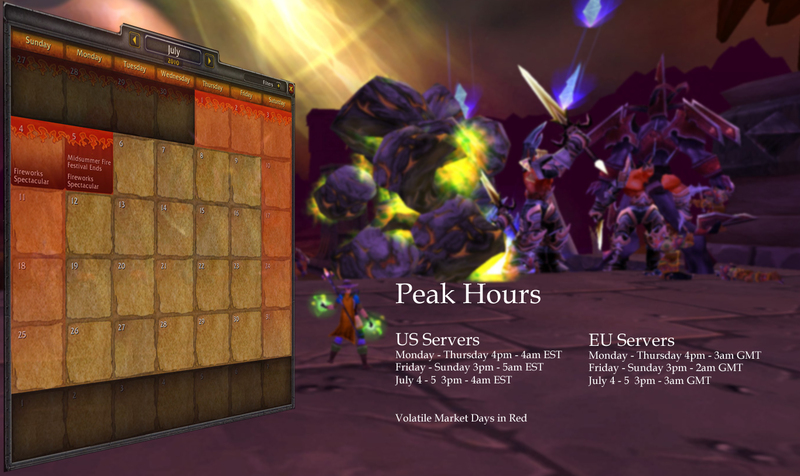 In fact, June one of the lowest months of the year for EU and US servers. Not to say there is no business to be done. Far from it. June is a great month to stock pile gathering mats such as ore and herbs. Since the populations are generally low, most nodes are uncontested, even during peek hours. Build up the mule bank with items that will be best sold much later on. The highlight of this month is the Midsummer Fire Festival. Not too much can be done as far as farming for the special event. However, players will be on a mad dash across the lands to find well placed bonfires during the starting days of June 21st through the following weekend. Stragglers will eventually pop up toward the end of the event in July for a second surge in population. The most profitable service will be porting by mages. Players will pay a couple pieces of gold to travel via portal if is save them 10 to 20 minutes in travel. Event Core Items will be frost resistant gear and enchantments to battle against Ahune in the Slave Pens. Infinite Dusts, Greater (and lesser) Cosmic Essences, and Eternal Fire is needed to make an “Enchant Cloak – Superior Frost Resistance“. The formula itself is dropped by Damned Apothecary in the Ice crown (0.4% chance). Frost oil and Large Radiant Shards are needed to “Enchant Shield – Frost Resistance” which is also a drop from 70 different sources. If you are an alchemist, take a run through the mana tombs to pick up your recipe for Major Frost Protection Potion (Core Items are Primal Water and Mana Thistle). The boss (Nexus-Prince Shaffar) will drop off the recipe in both heroic and regular mode that will only be seen by alchemists. This may take a few runs as the drop rate is almost 1%, but the overall gain is worth it! Upon creation of the Major Frost Protection Potion, you will discover the “Cauldron of Major Frost Protection” (Core Items Primal Water, Mana Thistle, and Fel Iron Casing). The cauldron will create soulbound potions to be shared 1 at a time with your party members and the cauldron itself can be sold in the AH (level 60 and up, but no class restrictions). Expect another low month for peak hours. This will be largely in part of Blizzard’s long waited release of Starcraft II. Also, due to the lack of events this month, WoW has nothing new or exciting to look forward to do. Expect the markets, in whole, to remain stable and steady throughout this month and the next. Peddling Services will also be at a low. The only exception being the end of the Midsummer Fire Festival, where players will arrive for last minute ports for bonfires and battles against Ahune will be played out. The nights of the fireworks celebration will be the highest peek of the month. Be sure to place your best sales on July 3rd for the best rate of profit. During this month will be a great time to level your characters to their max for the up coming Cataclysm events. There will be many quests, rare and hard to get items, and most likely easy rep points that will be available only to higher rank characters. For PvP gamers, take this time to rack up honor points. The battlegrounds will only get more massive once a bulk of the players make a return to Azeroth at summer’s end. You will want to have only the best gear to spank them with and teach them a lesson for giving you to time to perfect your skills. Farmers should concentrate on the core list. Sell only half of what you gain. The markets will be on the low from regulars constantly undercutting each other and bringing the average market price down. Expect prices to rise again in late August. Have your mule save the other half (or buy out cheaply undercut core items) for that time. There are no major events in August. The first week will have the Darkmoon Faire, but this event is played out several times in the year and most players are quite bored with it (unless your server really goes all out for it). SC II and summer vacations will still draw the majority of the regulars away. However, at the end of the month (and from late July for some countries), school is back in session and normalcy returns to peek hours. Expect markets to be the most unstable towards the end of the month. Speed leveling and collecting core items should continue throughout the month. Choosing when to unload will be up to you. It is advised to begin unloading starting August 27th and on. You can, of course, save your collected goods until the release of Cataclysm events. If and when you clear out the mules of trade goods, be careful not to flood the market in the process. Doing so will lower the value of your goods and spark others to massively undercut your sales. September 2010 thru December 2010 will be released in July / August when more reliable data will be made available. There are some things in life that is hard to sell. Your time, effort, and crafts are usually one of them. Not everyone needs a JC at the same moment you are offering your services, and few truly understand the money needed to get those expensive Titanium Powders. Let’s figure out how to maximize your talents. To get your business going, you will need to be present and ready at peak hours. This is when the biggest bulk of players are on. Within this time frame, find yourself a major city to plant yourself in, other than Dal or Shatt, and what hours you are willing to work. Keep a schedule and keep to it as often as possible. Advertise yourself via Trade Chat every 5 to 15 mins. Don’t SPAM! If you want to work for tips, let them know upfront. If you want to use your mats or have them bring their own, again, let them know up front. Nothing loses a large base of customers faster than traveling around the world and then find out there’s a fee to the service. Be competitive. If someone is porting people to Dal for 10 GP, then charge 5 GP. Understand that a person of different levels will have different amount of money on them. For repeat customers, adjust prices to be fair. I’d port players to Dal for 10 GP a ride, but if you are a level 20, I would gladly lower my prices. If you are going to sell yourself, you need to stand out. That GS 5000 gear you are wearing may seem impressive in battle, but this isn’t battle. Tuxes, holiday wear, and dresses will help you stand out in a field of armor plated scourge fighters. Guilds can benefit as well. If you have guild mates that want to cash in too for an hour or two, then group together. Put on the tabards and look sharp as a whole. Advertise the guild not the players within. Don’t forget promotions. Need customers? Give free gifts, discounts, vouchers for future transactions. For vouchers, mail yourself a copy of a self written coupon. And never forget to say thank you, even if they don’t tip. Alchemy, Blacksmithing, Enchanting, Inscription, Jewel Crafting, Leatherworking, Tailoring, and First Aid are all basic Link Posts. You put your link up and people will come to you with requests. Consumable items such as bandages, elixirs, scrolls, wizard oils, grinding stones, and armor kits you should have on you and pre-made. You can charge in bulk or per request. If you are an enchanter, throw up your enchanting link and announce that you have custom weapon and armor vellums for sale. Many players have soul bound items that need that kind of service. Lock Picking and Key Services are a bonus. Even selling keys in bulk can be profitable to other smithies who don’t wish to put in the time, effort, or money to make their own. Lockboxes are everywhere and not everyone can unlock them. Running and Signing are very common place, too. Volunteering to sign charters can net you some simple cash for your lower level characters. Mid to High level characters can also gain a slightly larger profit by running lowbies through much needed instances for a fee. A typical Dead Mines run can be done in less than 20 minutes. Keep in mind to protect your clients while you are culling the dungeons; they may try to get in the action and wind up dead themselves. Prospecting is straight up common sense. Are you a miner/blacksmith that need certain gems that cannot be found on the AH? Find a prospector and hand over those ore to be broken down! Offer Package Deals. You have the complete lists for all profession guides level 1 – 450. If, while in your travels you collect all the parts needed to power level any character quickly, SELL IT! Write a letter to your self how to power level a skill for x level to y level, then have the mats available. Sell 59 Peaceblooms, 59 Silverleaf, 59 Empty Vial, 80 Briarthorn, 30 Bruiseweed, and 30 Leaded Vial, plus the letter. No matter what you do or how you make your money, when it stops being fun — STOP. Your service should be seen as a much needed benefit to the WoW server community, and not as your second job while at home. As soon as it starts to feel tedious or boring, drop it and move on to something else or every time you log onto WoW, you’ll find that nothing about the game will make you happy. But do enjoy what you do best.